We have finished our laundry room and I am beyond excited because it is functional and pretty darn cute. I am so thankful to have a place to fold laundry that doesn’t involve me hauling clean clothes half way across the house to a bed or floor to fold. In our last home (rental) we had absolutely no available space on top of the washer or dryer because it had to also act as our pantry (gasp right?). So, when we bought our new home I was giddy that the laundry had a designated area and I couldn’t wait to make it functional. Lets cut to the chase, I spend lots of time dealing with laundry and I absolutely dislike it beyond measure. I figured if maybe, just maybe I liked the space I was working in, that I may just enjoy doing the laundry. We’ll see if it works now that the laundry area is completed. This redo cost little to nothing and that is what I want many of you to understand. Making a space like-able, functional and appealing doesn’t have to cost a fortune. Sometimes it just takes being resourceful, handy on a small measure and creative. This is what we created for almost nothing!!! Continue on for all the details. It had baby blue walls, a chalkboard-like white paint on the cabinets (honestly never seen a finish like it), yellowed trim, horrible carpet and extremely dated washer and dryer. And yet I saw this space and it was like hearing birds chirping…I was in aah. I knew this space would work and work great! I couldn’t wait to get my hands on it. Here is the in-between stage; we had painted the cabinets with a fresh coat of semi-gloss pure white paint and the walls were painted with Benjamin Moore Light Pewter. We had the Frigidaire front loading washer and dryer already. The space was a bit better, but it was not working, it was always messy, and not functional at all. If any of you have tried to fold laundry on top of a washer and dryer you know how many socks and personal items have fallen between the two! Something needed to be done and quick. So my husband and I got to work. When we started looking at the options of either a large piece of wood approximately 28″x65″ or a slab of some type of counter top to make into the shelf we wanted, we were looking at more then our little budget could handle at the moment. We happened to have an extra door that used to be part of our three door bathroom (don’t even get me started on that) that my husband decided would work just right. It would need to be cut down a bit and the door handle hole needed to be filled in. Wood putty to the rescue for us. Here you can see where we have filled in the door handle hole. And final step, just painting over what we had filled in and it disappeared. We let the door dry and then we installed really simple, black metal brackets similar to these from Home Depot to hold the shelf up. This laundry area is part of the main hallway so it had to be appealing to the eye and I have to say we are really enjoying it. I hope you do too. Can I get a rain check? I absolutely love it! What an awesome space! Thanks Jamie…can't wait to see what you do with your new home! Simply beautiful, thanks for sharing. Loved this makeover SO much that I featured you today on Work it Wednedsay no. 3!! Make sure to come check out your feature! Anything black and white works for me! I love the black machines… I just redid mine and got new machines too.. I love your inspiration! Are the baskets like drawers that pull out or do they just rest on top of the machines and what do you use them for mostly? It looks so great! I love that guide to laundry symbols! Did you make it/where did you find it? I would love to have that on the wall of my laundry room! Hi Jennifer…I didn't make the symbols sign, but I love it too. You can find it on Etsy and it comes in so many colors…so fun! Beautiful space, simple & tasteful. Love the light fixture! Where did you find that beauty? Hi Amanda…thank you for your sweet compliment. Anything to make laundry more fun right?! The light fixture was actually available last spring through Target. My husband wired it into the ceiling. Sadly, it isn't available anymore. We're about to move to a new (to us) house and the laundry room also needs some updating. I love what you did with yours – very inspirational! Do you happen to remember where you got your rug? How exciting Stacy! It's so fun to get to put your own spin on a new space. That rug is Nate Berkus for Target. I think they still have them. For sure I've seen a few in store still if you can't find it online. Your new laundry looks fantastic. I love the colours. It looks clean and fresh. Great job! It's Benjamin Moore Light Pewter…I love it. I have it through out my entire house. This is fabulous!! I totally want to do this now, I love the idea of building the counter since the bases for washers/dryers are like $200 each and then you still have gaps in between them! Inspired! Beautiful update! I love that rug. Is it from Target? Gorgeous! Thank you for the inspiration! Where is that RUG from!? HI! Thank you. It was from the Nate Berkus line at Target a few seasons ago. 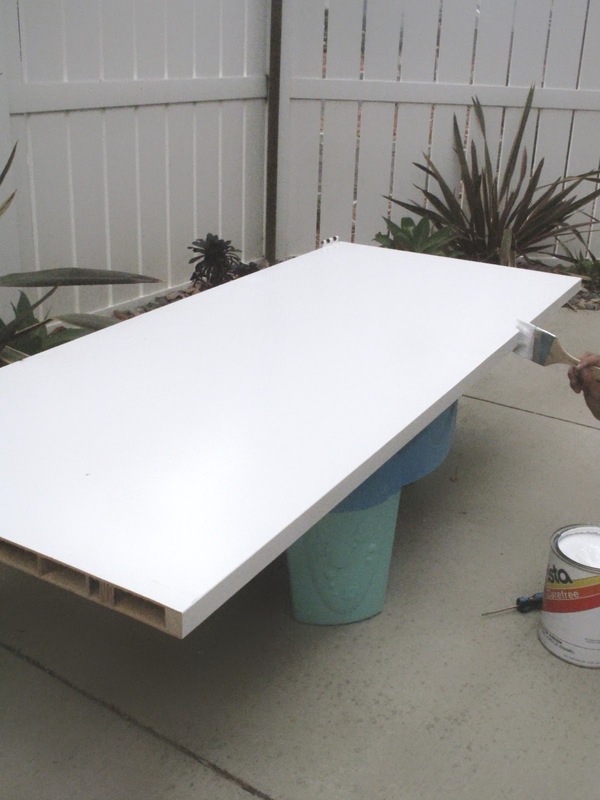 Using the door as work surface – and using a work surface – that was a brilliant idea. Also using the same colors all over, a very nice idea. It looks great. "This redo cost little to nothing…"
Well… I suppose to some people 100 dollars is nothing. It is sad to me that you feel it is necessary to criticize my post and my use of words when you don't even know me. You don't know if I budgeted for months to save that $100…you are just assuming I have it floating in my account to spend. This is far from the case in our household. I mentioned that I already had the front loaders which were gifted to us because, no we couldn't afford them. If you have an existing washer or dryer, but would want them black, you can paint them with an oil-based enamel paint and achieve this look….hence me stating to be creative. Try to not judge someone so fiercely that you don't know. Trust me…life over here isn't easy, but we are thankful and we try our best. You have done a very nice job sprucing up the look of your laundry area. One question: How did you accomodate the plastic washer hose box in the back wall? Do you just artfully leave the basket in front of it to hide it from view? Where did you get the black and white rug?? And the guide to laundry print? Thanks! The black and white rug was from the Nate Berkus line at Target. The laundry print is from a shop called Letter and Lined. This is a great inspiration for my remodeling of our laundry. Are those baskets on top of the washer and dryer and what do you use them for? The table (closet door) is a great idea. The area around the laundry quickly becomes the burial ground for socks. Nice ideas thank you for sharing. Is there a tray under the washer? 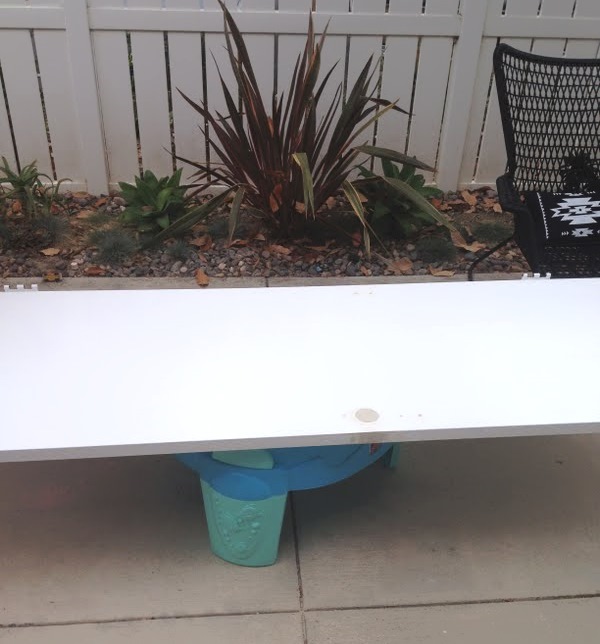 Ive been looking for a simple way to create the table over my washer/dryer. Thanks for sharing the details. I will definitely try this!